Do you want to volunteer? Yes, I want to volunteer! Do you, or a community you are part of, bank with a DAPL investor and want to close your account? Yes, I want to close my account! Yes, I want to pressure my school / church / community to divest! You may receive updates from #DCReInvest, the sponsor of this petition. D.C.: Divest from Wells Fargo to #DefundDAPL! Donald Trump has shoved through final approval of the Dakota Access Pipeline in spite of fierce opposition by indigenous leaders and allies. Although indigenous leaders are fighting the project in court, oil could begin flowing through the pipeline soon, threatening the priceless water source for the Standing Rock Sioux Tribe. As major investors in Dakota Access, Wells Fargo and 14 other banks are responsible for funding numerous human rights abuses and the continuous violation of indigenous sovereignty at Standing Rock. Wells Fargo's investment in Dakota Access is only the latest in a string of injustices the bank has supported throughout its history. Wells Fargo's record of fraud and racist housing discrimination, as well as the bank's support of the private prison industry, has also contributed to oppression of black, Hispanic, and working class people across the country — including in Washington, D.C.
San Francisco, Seattle, New York, and others have already moved to cut ties with Wells Fargo and other Dakota Access investors. We call on Washington, D.C., to do the same. On March 21, D.C. Councilmembers Grosso, Nadeau, Bonds, Silverman, Allen, and Gray introduced a resolution urging Mayor Bowser and the city's Chief Financial Officer to reassess D.C.'s relationship with Wells Fargo. This resolution is a key first step to severing D.C.'s ties to banks that fund human rights violations, and instead investing the city's funds in socially responsible institutions that empower D.C. residents and promote justice across the country. 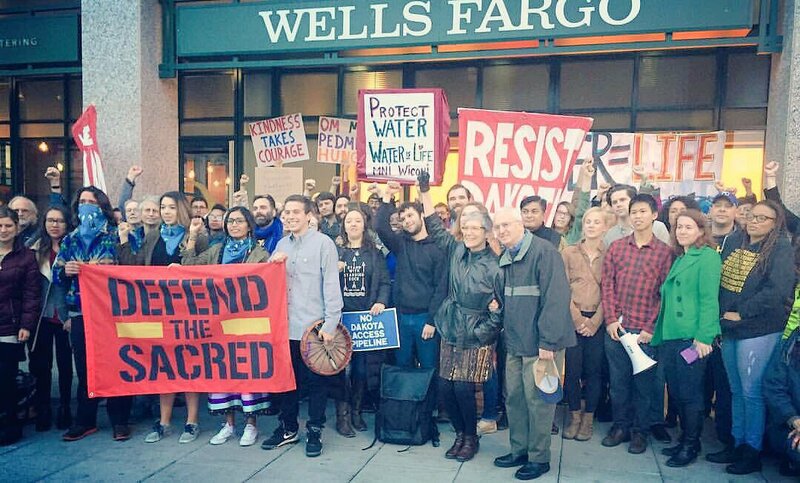 SIGN THIS PETITION to urge the D.C. City Council to pass the "Sense of the Council Urging Reassessment of Relationship with Wells Fargo Resolution of 2017" calling upon the city to cut ties with Wells Fargo and the 14 other banks funding Dakota Access! Wells Fargo and 14 other banks are complicit in the numerous human rights abuses and violations of indigenous sovereignty perpetrated by Energy Transfer Partners as it sought to complete construction of the Dakota Access Pipeline through the invaluable water source of the Standing Rock Sioux Tribe. Wells Fargo has also committed fraud against working class customers, racially discriminated against black and Hispanic mortgage borrowers, and financially supported the private prison industry, whose history of abusing and exploiting prisoners perpetuates the injustice of mass incarceration. I urge you, members of the D.C. City Council, to call upon the City to sever ties with Wells Fargo and the 14 other banks funding Dakota Access, and consider just mechanisms for investing D.C.'s funds, by promptly considering and voting YES on the "Sense of the Council Urging Reassessment of Relationship with Wells Fargo Resolution of 2017."